1. Do you provide quotes or estimates? If the MS Access consultant does not provide estimates, it’s a major red flag. Quotes and proposals are a great way to get on the same page as your developer, otherwise you may be asking for trouble. Shy away from people that only offer a handshake to do your work. 2. What kind of certifications do you have? This is a trick question since there are no Access Developer certifications in existence. If a developer has a related certification, as in .Net or MCP, ask them whether the skills gained from the certification are useful with Access. If they quote an Access developer certification, you have to wonder what else they will fib about. UPDATE: As several readers have pointed out, there were certifications in the past provided by Microsoft and third parties, such as Brainbench, but they are no longer offered. 3. What is your backup strategy during development? What is your backup strategy when the app is installed at my company? If you get blank stares from this question, you need to head towards the bright, green exit lights. Backup strategies are a must during development and deployment. An Access developer worth his/her salt will be glad that you asked this question and will discuss and develop strategies with you. 4. Do you consider yourself a macro developer or VBA developer? There is nothing wrong just using macros in Access, but I don’t believe a macro-only developer can deliver as great of a solution as VS a VBA developer. 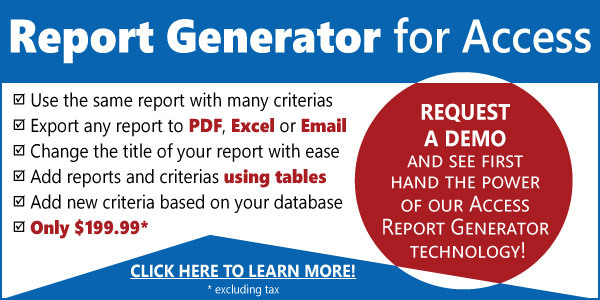 Hands down the VBA guy will do a better job every time. 5. 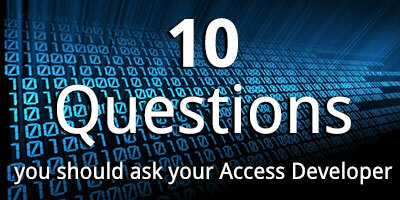 What version of Access do you love using? If someone says they love Access ’97 or 2000 and you have 2007 or even 2010, you should consider going with someone who uses a more recent version. Why? The newer versions use tab view and can create PDFs directly from the application. Someone stuck in the past may not know or be willing to use these features. 6. Do you have a website? Do you have a calling card? In this day and age of getting a website for $300, no self-respecting professional should go without one. Yes, there are great developers with no website, but do you want your business to trust someone who will not bother to have a professional calling card? It’s important you talk with other businesses that have worked with the consultant before, even if they have glowing reviews. (They all should be, otherwise they should not be a reference). Ask them how responsive your consultant was, whether they accommodated to emergency requests or whether they disappeared for weeks on end. 8. What has been your most challenging Access problem, and how did you solve it? Granted you may not understand all of the techno babble, but what you are looking for is to gain insight on how the developer handles problems and whether he/she tends to formulate a plan of attack. 9. What has been your greatest work? With this response, you want to listen in on the features and accomplishments that make your consultant proud. Do the features sound useful from a business perspective? Does the quoted work sound like a great solution? I use this question to highlight wonderful solutions I’ve built for companies in the past. 10. Are you going to charge me for bug fixing? This is a great way to clear up the atmosphere before work gets started. The answer to this question will let you know the frame of mind a consultant has in regard to the project and your business. I hope this helps you evaluate your MS Access consultant, and I look forward to new clients asking me these questions going forward. As you can imagine, I have some great responses lined up! Item 4 is wrong especially considering Web App do not allow VBA so it becomes crucial to find an extremely competent Macro developer! Item 6 is wrong, once again looks ahead of actual competence. I would much prefer seeing demo of past work that checking out a website that he paid to have someone put together. Also, there are numerous top notch professional developers without websites… even MVPs! Items 7,9 & 10 are the key points! this ten question is always comes in mind that but every time Business developer is solved my problem. Juan, you said “If they quote an Access developer certification you gotta wonder what else they will fib about.”. Unfortunately you’re wrong. There were two Access certifications from Microsoft (one MCP for A97 and a beta MCP for A2000) and a few others from BrainBench. I have all three. Arvin Meyer has the A97 MCP too. Does that mean we’re fibbing? No, I will update the post accordingly.